Subaru driver David Higgins and co-driver Craig Drew drove yet another faultless rally to take a dominating win at the 2018 Ojibwe Forests Rally, earning their third straight victory and fourth total of the 2018 American Rally Association (ARA) season. Higgins led from the start of the rally in his Subaru WRX STI and then expertly managed his lead to take victory on the technical Minnesota dirt roads. Higgins’ teammate and rival Travis Pastrana, with co-driver Robbie Durant, made a rare mistake on the opening stage and was forced to miss the first day of action before re-joining the rally the next day. 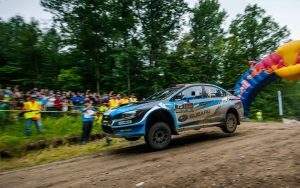 The twisty Ojibwe stages are some of the most challenging of the year, featuring narrow, dusty roads that wind through the lakes and overgrown forests of northern Minnesota. The fight for the 2017 ARA championship came down to the final stage of the Ojibwe Forests Rally last year between Higgins and Pastrana, with Pastrana narrowly coming out on top. This year the event sits earlier in the ARA calendar, with two events remaining in the championship season. “It’s always more fun when you can drive maximum attack, but when you have a good lead it’s really important to manage that all day,” explained Higgins at the podium celebration. The expected close battle between Higgins and Pastrana never came to fruition as Pastrana was caught out on the very slippery opening stage and clipped a concealed cement block. Although he would power through the remainder of the stage, suspension damage to the #199 Subaru would force Pastrana and Durant to retire from the day’s remaining stages. Higgins would press on, taking the lead and managing it for the remainder of the event, while Pastrana re-joined on the second day and went ‘maximum-attack’ to secure overall fastest times on most of the Day 2 stages. “Well that’s not the way you want to start a rally. With the rain we weren’t sure how slippery it would be, and it ended up being pretty slick! I came around the corner wide and saw what I thought was a soft hay bale barrier. Nope,” explained Travis Pastrana. 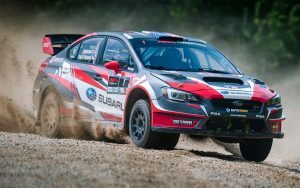 The next ARA round for Subaru Rally Team USA is the Idaho Rally, a new event to the national calendar, to be held September 14-15 in Boise, Idaho. Subaru Rally Team USA will enter David Higgins and Patrik Sandell, with Higgins looking to secure his first ARA national championship.